Standing ovation, hand clap, victory, about time! Yes I’m 2 days late with announcing the winners but hey anticipation is good right?! I know naughty Fi, apologies, moving back home after 4 years away is one interesting experience, claiming my territory has been a real TV episode!!! Anyway I’d like to start off by thanking the wonderful, amazing, and kind brands/companies that sponsored the two week giveaway period. Besides their generosity I’ve also built some great relationships with some of the owners, and it’s real encouraging knowing how supportive they are of their bloggers in the Hairsphere! Today’s Hair | Wigs and Summer Hats! I’m so excited about progressing into this next phase of my life! Career start, a BUSY summer and best of all some serious blogging and family time! In other news and more relevant to the post title, I just wanted to share my new friend… la summer hat! As much as I have loved hosting these wonderful giveaways I am itching to get back to real time blogging! I’ve never been so blessed with so many sponsors and I would absolutely love for you all to win something, so before it clocks midnight UK time, enter as many of the giveaways as you can!!! Events keep rolling in… Curls Unleashed UK Launch!!! The lineup of hair events this summer is crazy! I have to say this has been the busiest year in the UK Hairsphere- keeping up has been no joke! #Jones’! Well another event has hit the scene and this time everyone is invited! 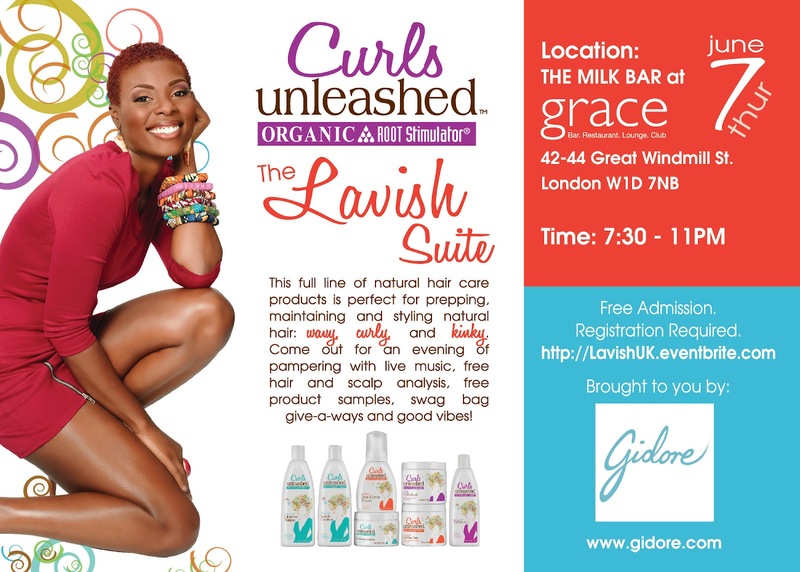 Once again Gidore will be bringing us another fab UK launch; this time of the new Curls Unleashed range from Organic Root Stimulator! It’s the final giveaway of the LYT B’day Extravaganza folks! To round things off Anita Grant [whose Creamy Cafe Latte has been my skins saving grace for over 6 months now! ], has been graceful enough to give one lucky reader a box of her wonderful shampoo bars!!! If you aren’t as forgetful as I am and can remember as far back as 5 months ago when I did a video review on the Anita Grant shampoo bars, you’ll remember that they gave my hair a real good clarifying hook up when product build up decided to surge its way into my life! Remember my product spotlight post on As I Am? Well Gidore have hooked LYT up with not a first, nor a second, but a third sponsored Giveaway as part of the LYT Birthday Extravaganza! UK retailer Gidore is known for sourcing highly sought after products which UK hair lovers cannot easily access due to customs and all of the long winded joys of purchasing products from the US. I have yet to try the As I Am range but aspire to in the near future. Beautiful Textures UK Launch Ticket Giveaway Winner! Before announcing the winner I owe Gidore a huge thank you for sponsoring this giveaway and for also inviting me along to a much needed evening of glam to celebrate finishing my degree! THANK YOU!!! Please send an e-mail to LYT with your name and the name of the friend you will be bringing along to the launch! I still struggle to remember how and when I came across SheabutterCottage but ever since then, I have yet to find a retailer of natural ingredients and oils as reliable and committed to fair trade ethics as SBC. My Jamaican Black Castor Oil, Henna powder, Hibiscus powder, Ayurvedic herbs, Extra Virgin Coconut Oil and a ton of butters and oils are all bought from SBC, it truly is the perfect one stop for mixtress cravings and hair recipe ideas! Hairstyle Profile | Twist-Out… who’s the boss now!!! I’ve been grinding on this transitioning journey for a good 6+ months now and God knows if I had it my way I’d rock a middle part bun for the next 14+ months of this transition! HOWEVER, I’m tryna to keep the hubby and stay on top of my swag game so a lifetime in buns definitely won’t cut it, hence where the urge to conquer my twist-out fear came into play on Saturday afternoon! Here’s a sneak peek below just before I commenced with styling! So far I’ve been enjoying the LYT Original Moxie Challenge, the products are very unique and I love the fact that each product is tailor made to specific hair needs and curl types, it really is original!